Any U.S. CheerABILITIES & DanceABILITIES teams that would like to receive a bid to perform/exhibition in the CheerABILITIES or DanceABILITIES Divisions at The Cheerleading and Dance World Championship in 2019 may submit a video for qualification. 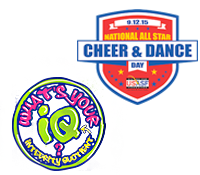 Up to 5 U.S. CheerABILITIES teams and 5 DanceABILITIES teams, (limited to one team per program) are selected to receive "At-Large" bids. The number of participants that performed on the competition floor in the video at the qualifying event may not be exceeded by the number of participants performing on The Cheerleading & Dance World floor. At the 2019 Cheerleading and Dance Worlds, the athlete must be at least 5 years of age as of August 31, 2018. Bid winners must accept the bid via their member portal within 48 hours. Any At-Large bid not accepted may be transferred to an alternate team at USASF's discretion. Teams may only submit an unedited performance from a USASF Member Event Producer's Sanctioned Event. Deadline for online form/video submission: March 3, 2019. Teams submitting a video for a bid will be evaluated using the USASF CheerABILITIES OR DanceABILITIES Score Sheet which can be found in The Connection. DanceABILITIES teams will be scored on a fair play score sheet not broken up into genres. Cheer Teams must have at least one coach credentialed to Level 2 in both Tumbling and Building or one in each in order to be bid eligible. Contact Glenda Broderick with any questions. Entry fee is $50. You may submit as many routines as you like, however only one team per program can earn a bid. Example: Happy Stars DanceABILITIES A can submit a Pom and Jazz routine. Happy Stars DanceABILITIES B can submit a Hip Hop and Pom routine. You would register each team separately and have 2 entry fees per team totaling $100 each. Selected teams receiving At-Large bids, along with all scores, will be announced on the USASF.net website on March 8, 2019. Click the link below to complete the entry form, provide payment, and to upload a link to your video. Be sure your video link is operable! Let your Event Producer know ahead of time that your CheerABILITIES or DanceABILITIES Team will be qualifying for a bid to The cheerleading and Dance Worlds and will need a copy of their performance on DVD/flash drive before you leave the event. In many cases, the video staff can pull your routine after your performance and save you the wait time!